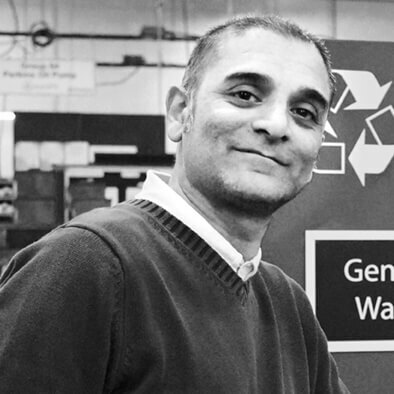 Ram Kumar and Mark McFall play major roles in the effort to continuously improve environmental sustainability at Concentric Birmingham. It is Ram’s job to ensure that the site is compliant with environmental legislation, lead external and internal audits, and monitor conservation and Ultra Filtration (UF) equipment. 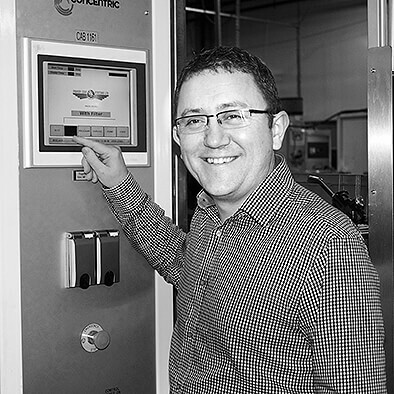 Mark is responsible for new project management, including the introduction of new and/or improved processes onto the shop floor, supported by his deep knowledge of continuous improvement techniques such as Kaizen, Lean and Six Sigma. Interview with Ram Kumar, Environmental & Fluidcare Manager, Birmingham and Mark McFall, Manufacturing Engineering & Continuous Improvement Manager, Birmingham. Ram: Sustainability is a state in which the demands placed on the environment can be met without reducing its capacity to allow all people to live well, now and in the future. For Concentric, that means ensuring that from design to procurement to end-of-life of our products we use materials that come from sources where environmental considerations are at the forefront. Mark: To me sustainability is primarily about not depleting our resources, about reducing our carbon footprint and finding ways to improve the way we work in order to minimize any harm. What's great about my role is that I can see that it has a direct impact in terms of our products, processes and people. What sustainable working practices do you see in your day-to-day work? Mark: I see them everywhere – from the way parts are delivered to us in returnable packaging, to the processes we set up on the shop floor, and beyond. If we look at machining we have optimised processes in order to minimise the effort to machine our products as well as line balance our cells in order to optimise our people. In our newer processes we request that a sleep mode function is fitted to the machines to reduce energy consumption. We also reduce tank sizes in order to minimise the amount of time oils need to be heated, and we add oil evacuation stations to machines to minimise oil loss. Other examples include controllable lighting, air and heating systems, which save a lot of energy. We have a new insulated roof, new machining technology, new tooling technology, and our assembly and test cells have been set up based on No Fault Forward philosophies. We also have well-established recycling programs for cast iron, aluminium and water, as well as some types of wood and plastic. Ram: Both recycling and re-use are big focus areas for us now. We aim to reduce our landfill waste to zero by sending our general waste to a Material Recovery Facility for processing. In terms of procurement, we try to use easily recyclable materials as much as we can, to avoid depleting non-renewable resources. I would also like to highlight the fact that our machining centres that use water soluble cutting coolant are cleaned out daily as part of the Total Productive Maintenance (TPM) programme. This is a full cleanout of the machine’s sump – first the used coolant is removed, then the debris. The used coolant is taken to our Conservation unit for recycling, where it is passed through various filtration sections to remove debris/free oils, until the coolant is ready for reuse across the plant. This process ensures a significant reduction in the amount of fresh mains water we use. Why are we putting so much energy into sustainable working practices? Ram: I really think sustainability and efficiency go hand in hand. Reducing energy consumption shrinks our carbon footprint at the same time that it saves money. Also, I think there’s growing awareness about the importance of sustainability among our customers, and their customers, and an increasing willingness to pay a premium for more environmentally sound products. Mark: In the beginning it was about legislation and compliance relating to things like emission levels, gases within air conditioning units, segregation of waste, recycling and so on. Then we wanted to meet accreditation targets for ISO14001. Now I would say that our sustainability efforts are driven by our customers, by market expectations. Also, we have seen some financial benefits both in terms of marketing and turning waste products into revenue streams. How do employees, customers, investors and the larger communities in which we work benefit from all this? Mark: Our commitment to sustainability gives our employees confidence in our long term future. The deeper our commitment to sustainability, the better the shop floor environment has become as a workplace, in terms of lighting, heating and housekeeping, for example. The benefit to customers is that we can better control our consumption cost and gain a competitive edge with our newer technologies. For investors, I think the benefit is mainly in terms of competitive edge and increased confidence in our longevity as a business. The communities we work in benefit in terms of peace of mind, knowing that we are not engaged in harmful practices. Ram: For employees, we’ve seen that the cleaner working environment has led to high staff retention rates. They are also very positive about the recycling programme, because it proves to them that we care about the impact we have on the local community, the place where they and their families live. For our customers, I think our commitment to sustainability is important because it shows that we are proactive about a major global issue, rather than waiting for someone else to do something. Looking forward, identifying ways to reduce waste offers so many benefits in terms of resource efficiency, sustainability and cost savings. Equally, there is great potential in re-using and recycling materials. These can provide much-needed resources for the manufacturing sector and often use less energy and water, further reducing the overall environmental impact of our plant.